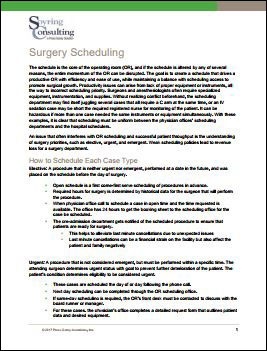 The goal is to create a schedule that drives a productive OR with efficiency and ease of use, while maintaining a balance with scheduling access to promote surgical growth. Many issues can arise, such as more than one case needing the same equipment simultaneously or overlapping in cases causing staffing conflicts. A good schedule in place will help eliminate these problems. How can you improve scheduling in your organization?